An alternative to the traditional wheeled walkers, the Juppy Baby Walker “Momentum” is a parent-assisted tool that helps babies comfortably and safely learn to walk. 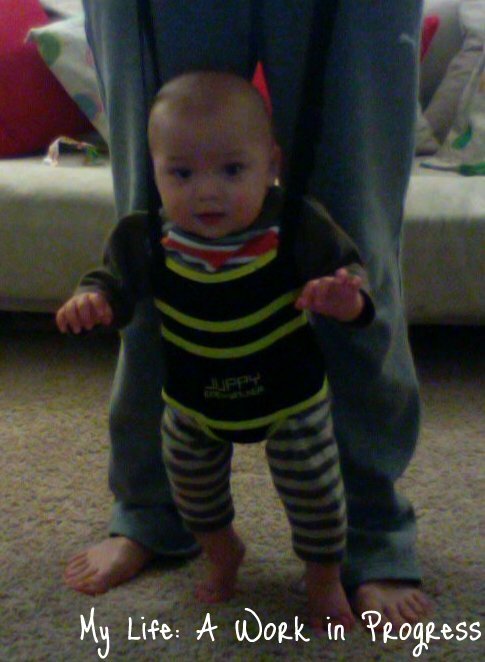 Using the Juppy, you can help your baby learn to balance better while walking without killing your back! It’s easy to use- just slide your baby’s legs through the leg holes, pull the Juppy up around your baby (just like a pair of pants), and then zip up the back. An updated version of the original Juppy walker, the Momentum is breathable, soft, and machine-washable. It’s 22″ wide in circumference and 11 1/2″ long from top to crotch. It holds up to 35lbs. For a small fee (currently $6.95), you can even personalize your Juppy Momentum by adding your baby’s name to it. It’s portable and small enough to fold up and stuff into an included storage bag. 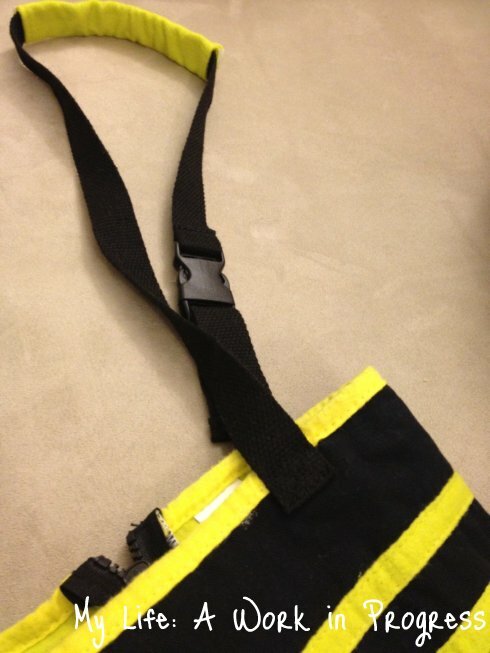 You can then carry it in your diaper bag or purse. The straps on the Juppy are adjustable to accommodate a variety of heights, from 4’11” t0 6’11.” The hand grips on the straps are soft for the comfort of the parent or adult assisting the baby. Besides adjusting the length of the straps, the buckles also allow you to get your baby in and out of the Juppy more easily. 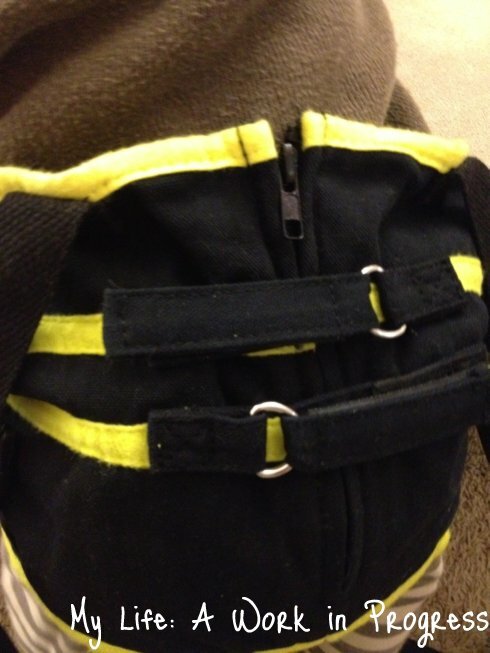 The two Velcro straps over the zipper strengthen the core of the Juppy itself. In addition, you can pull these tighter or loosen them to adjust the fit on your little one. When I received the Juppy Momentum to review, I was expecting it to be constructed similar to a baby carrier like the Baby Bjorn or Beco, but it’s not. It’s lighter, thinner, and the materials don’t seem as expensive. That’s not surprising though… it’s meant to support your baby’s balance not carry him. 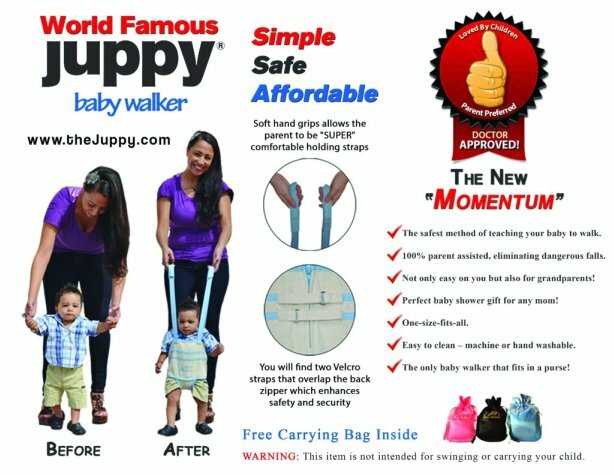 At $29.95, the Juppy Momentum also costs significantly less than a baby carrier. 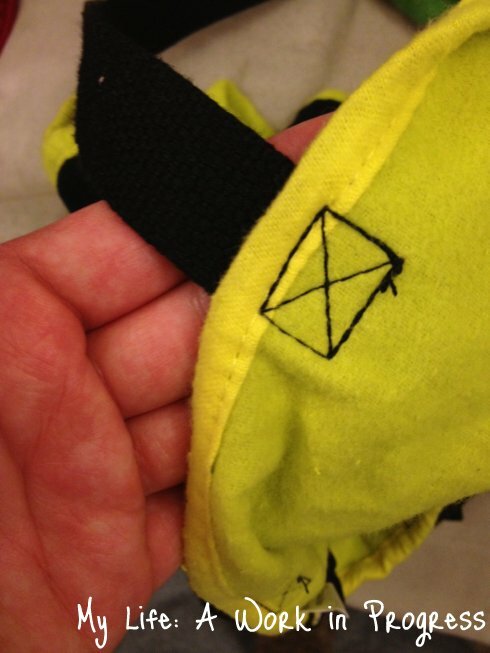 The X stitching on the inside provides security and support for the straps that are attached to the body of the Juppy. Before I put Baby J in the Juppy, I was concerned it wouldn’t be very comfortable for him. But as you can see below, the fabric is nice and wide around Baby J’s bum, supporting him well. Baby J isn’t quite sure yet about the Juppy Momentum walker. He’s been pulling up and cruising since before he was 7 months; but at 9 months, he’s not ready yet to walk without holding on to furniture or pushing his little activity walker. After trying several times throughout a couple of weeks to get him to use the Juppy, he’s starting to get the hang of it, but we can only use it for a few minutes at a time before he gets upset and sits down. I think he’s probably just too young and not physically (or mentally) ready for it yet. But that will change, and I’m looking forward to using the Juppy more! I’ve “walked” with my friend’s kids and my nephews the non-assisted way (bending over and grabbing their hands). That way really does start to hurt your back quickly from hunching over. This is especially true for me, being a tall woman at 5’10.” I don’t have this problem with the Juppy, obviously, because of the straps. Watch this short video to see the Juppy Momentum in action! 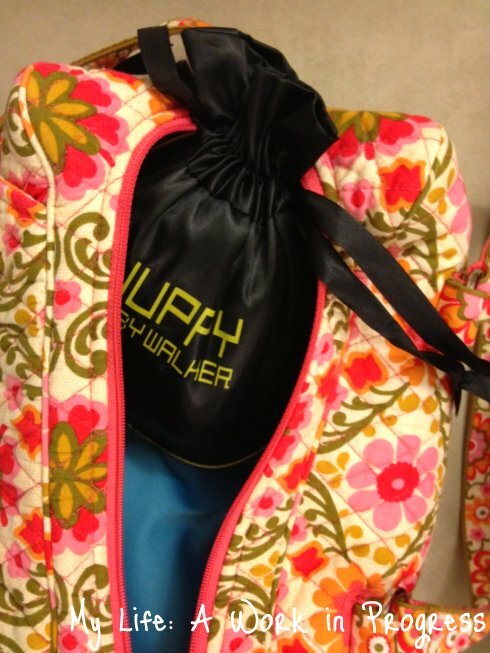 Want to learn more about the Juppy or purchase your own? Visit them on their Web site HERE. Keep up with the latest news by following them on Facebook, Twitter, and YouTube! 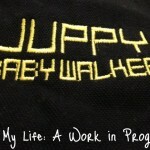 You could win your own Juppy Momentum Baby Walker right here on My Life: A Work in Progress! If you agree to the Terms & and Conditions, enter through the Rafflecopter widget below. GIVEAWAY CLOSED- WINNER: Entry #137 Kim C.
Terms & Conditions- Sweepstakes open to residents of the US. Must be 18 years or older. Void where prohibited by law. Odds of winning depend on total number of eligible entries received. Winner chosen via Random.org. Once winner has been selected and emailed, winner will have 48 hours to respond or new winner will be selected. Winner’s first name and last initial will be posted on this blog and other social media and Web sites. 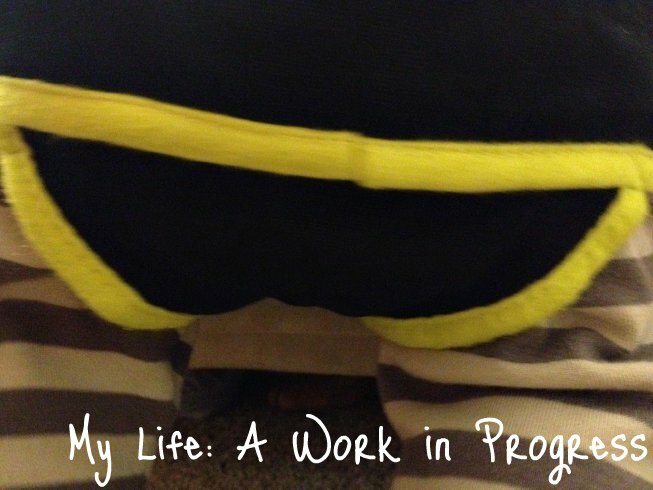 My Life: A Work in Progress is not responsible for prize fulfillment. Entrance into the sweepstakes indicates acceptance of these terms and conditions. I like the thought of not bending over or shuffling on my knees. I sur am tired of that! Adorable 🙂 My little one would love this – she’s trying so hard to stand already! I like the fact that you can stand straight up, Which helps people like myself that have bad backs and a baby that’s getting close to walking age.. I would have loved this when my kids were little.. Thanks for sharing! Wow, I did the same review – there are so many different ways to describe the same product. Good review. I like that the little one can have his hands free and that it will save my back. I love that the Juppy teaches the baby balance while you maintain your natural posture, therefore getting rid of the grueling task of hunching over while teaching your baby to walk. We could really use one of these because our baby has started to trying to walk. Thank you for having this awesome giveaway. I like that my baby would be hands free and I wouldn’t have to bend over! Love that it can help teach a baby to walk. I like that the Juppy is so very light and portable! I love not having to bend over!!! I love that it wont hurt my back, that I can stnad up straight. I like how it’s easy to clean – either machine or hand wash. I also like that it can be used for a child with special needs. kristiedonelson(at)gmail(dot)com Thank you. I like that the design is made for parent involvement rather than throwing the kid in a traditional walker and letting them figure it out on their own. For me it is the safety of the product. My favorite thing about the walker is the adjustable straps.